It's time for another Weeknight Dinner for the Working Woman (or Man). I'm telling the hubster it's because eating at home is healthier and better but in reality, I'm saving our eating out allowance for this. Shhh. Note that these dinner leftovers make the perfect bagged lunch the next day and will save you from eating at mediocre lunch joints. See, at least once a week, a coworker will ask me if I want to go to a Chat Cafe type of restaurant. I say "type of restaurant" because you know your city has one. You may even be guilty of frequenting said restaurant. Cheesy orange painted walls plastered with Bollywood posters anyone? Said coworker strikes when I'm frantically typing the final sentences of my brief, calling a client, and unsuccessfully trying to download a PDF document on my computer. At that moment, I'll likely say yes to anything just to get the person out of my office. Oh, that reminds me. Coworker X, you can't have my new shoes. It ain't cool to ask when you know I'm vulnerable. Next thing I know, you'll be wanting a kidney (and yeah, even if I say yes, I mean no). So, back to lunch. Inevitably, come noon, I find myself staring at said lunch joint's menu while being masqueraded by the latest Bollywood soundtrack pumped at 8000 decibels. Last time, I saw a samosa salad on the menu. Seriously, who does that? Where does the samosa end and the salad begin? Really people, you can't mix two clearly unrelated items together, call it fusion, and hope for the best. And along comes my indiscernable lunch posing as "Indian" food. I confess, I don't make a lot of "Indian" food. First, because my family is from Pakistan and I'm not really sure where the line between Indian and Pakistani food is (I'm guessing somewhere around beef). Second, because my mom is an awesome cook and cooking her food (only not as well) makes me feel like a bit of a failure. Look, we all have our knock-yo'-socks-off dishes and unfortunately, most of mine aren't from the subcontinent. So, therein lies the conundrum. I can either let some high school kid cook and feed me a sad version of my people's food or I can make it myself and eat it while wearing my pajamas and watching True Blood. I vote for the latter. Enter the Chicken Tikka Wrap. I confess, I'm not really creative enough to have come up with this on my own. I'm sure I saw it on the Chat Cafe menu at some point and in my normal take-on-the-world way, thought, "I can make this better." Plus, I have no idea how long the restaurant chicken's been sitting there and the meat to bread ratio is always off which bothers control freaks like myself. This recipe is über-versatile and takes less than twenty minutes to put together so it's perfect after a long day of fielding questions from clients and muddling your way through the latest case law. Speaking of which, way to go Supremes for the latest round in the Carachuri-Rosendo showdown. If you really are strapped for time, or are weird and don't like making your own spice blends, you can buy a premade container of tandoori spice at your local grocery store. Or, you can just as easily mix the spices below and stock your own brand of tandoori spice mix. The latter option bumps up your foodie street cred and lord only knows, Cheetos-loving me can use all the help in the foodie cred department. You can also use the greens of your choice. I generally opt for spinach because of a childhood affinity for Popeye (and I don't mean the fried chicken, but that's delicious as well) but romaine and arugula work equally well. Iceberg, not so much. You think Popeye would have eaten iceberg? I think not. Let's talk wraps. I prefer using frozen parathas which we stock in our freezer in preparation for the great paratha shortage of 2012. Plus, the paratha helps me feel cool and lets me pretend I'm eating a kati roll, the latest food craze to hit New York City (all the while watching True Blood from the comfort of my living room). On days when I'm too tired to feel fabulous and heat a paratha, I nuke a tortilla or pita in the microwave. It tastes equally good but I don't feel nearly as cool. I serve the wrap with a simple raita. While I'd like to pretend there is some elaborate recipe and deep cultural secret to a fabulous raita recipe, the truth is it is nothing more than yogurt mixed with whole cumin seeds, salt and pepper. Sometimes I add some finely chopped cilantro to the raita party for no other reason than because that's what my mom does. You need to make the Chicken Tikka Wrap soon. You owe it to multiculturalism, diversity, and all those other feel good buzz words. But more importantly, you owe it to yourself, especially after the day you've had. Cut chicken into cubes, strips, triangles, or whatever shape strikes your fancy. Add yogurt and all of the spices and mix thoroughly. I prefer using a Greek or Arab yogurt because of the creamier consistency but really, you can use whichever yogurt you have on hand (unless it's strawberry. You can't use strawberry yogurt. It must be plain yogurt). Marinate your chicken mixture in the refrigerator while you contemplate your TV show of choice. Heat 1-2 tablespoons of oil in a pan. Cook chicken. Aim for charred bits on your chicken because that's where you hit flavortown. Heat wrap of choice. Layer with greens and chicken. Cut the wrap on an angle because it looks cooler and really, who doesn't want to feel cool while eating? Gasp! That must be the best lunch ever!! I too am so intimidated by my mom's cooking that I rarely make Indian food either. And when I do I most certainly don't serve it to anyone who would know that my food is pretty terrible. 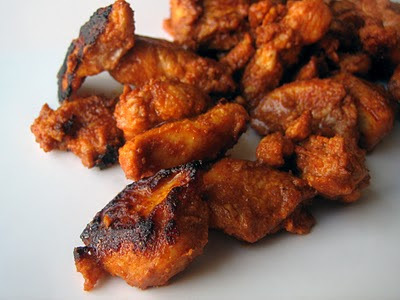 I love Tandoori Chicken because via the help of Shan Masala even I can handle it. Although I must say that when you break down the spices as you did above I might even be able to handle that! Love the K. Cole bag...so worth eating at home more. Sounds terrific for lunch or a light dinner! The mix of spices is excellent here! This looks wonderful!! 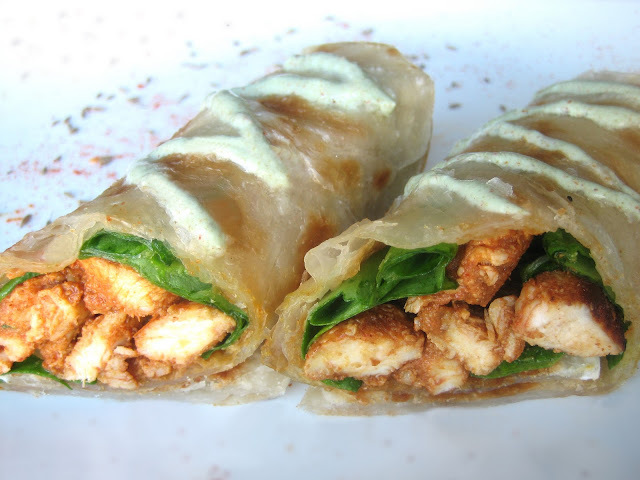 I love chicken tikka and using it in a wrap is a great idea. Totally worth eating at home to save up for that gorgeous purse! Totally going on my list of things to make. And I totally know those disappointing Chat Cafes. Berkeley was full of them and they always made me sad. So I started ignoring their existence. I have a question. What is the difference between Paratha and Naan? Is paratha the same thing as chapati? And True Blood premiere was disappointing probably b/c we didn't find out who took Bill. It was all a bit anticlimactic. That sounds delicious. Your chicken has a nicer color than the version in that kind of "restaurant". That looks delicious! And I will have to look for those wraps! ooh I love the briefcase :) Thanks for stopping by my blog!! Very nice to meet you and very happy to know that you love rasam. Try the one I posted recently or try this http://rajendermanju.blogspot.com/2010/03/rasam.html version. Even if it doesn't turn out right let me know so that I can guide you step-by-step. BTW you have a nice blog. Happy blogging !!! That chicken in the last photo is heart stopping. Wow, I usually hate chicken breast, but this I would eat on appearance alone. Great post. Tikka wraps are great! I love the idea of your series of WDWW... we all get into that food rut and your posts are always easy, quick and tasty. I can have leftovers for lunch for a few days! Ameena- Shan Masala is a total godsend! Did you know they make one for eggs? EGGS! I want to buy that one just so I can see if there's something other than salt and pepper in there. 5Star- Thanks! Mixing the spices was actually lots of fun! BB- I love Berkeley and particularly Top Dog but you're right, the Indian food was pretty dismal. A paratha is flaky flat bread, held together with ghee (or clarified butter). A naan dough has almost no fat and is generally made in a tandoor (hence, the awesome crispy, browned bubbles on the finished bread). A chapati is a simple flat bread close to a paratha without the flaky texture. Gourmande- Thanks! I, too, find the neon red chicken to be disconcerting. I much prefer my chicken tikka a healthy shade of orange. Alittle- I can't wait to see your post. One can never have too many chicken recipes! Kacy- Good luck with the search! My local Indian store sells about 86 varities in the frozen section. I've also seen 'em at Whole Foods. Life is- My rasam was more like a daal?!? I take it that's not normal?!? I will definitely try your version and report back. Jacob- Thanks for stopping by! We're huge fans of chicken breast or so I thought. The hubster recently informed me he's been humoring me. He actually prefers chicken thighs. I was devastated by the news. Housewife- Thanks! I figure I like parathas and I like tikkas. Put 'em together and I have the ideal meal! 1. Love the satchel. I want it in cognac. 2. Those wraps look delightful. 3. I know who took Bill...and I know "what" Sookie is...cause I read the books. You should too! 4. Thanks for finding my blog! I can't wait to try out some of your recipes! It looks delicious! What I like is how easy it is to make and that it is healthy. Thanks for sharing. Love your writing style. You're so funny! The tikka wraps look like a brill weeknight dinner I'm so going to make these mid-week, next week, when I'm all out of energy and creative cooking motivation (tonight's already got homemade pizza stamped all over it). Yum! Look at all that color and flavor! I love it. Perfect for baking a double batch and eating for lunch all week! Oh my gosh girly! That is some serious deliciousness going on there! What flavor! I might have to attempt to make this! Looks crazy delish! sounds like a great wrap!! I love the spices and the coolness of the yogurt..I know my girls would love this wrap! Thanks for the comment on my blog girl, which got me to yours. Goodness your wrap looks simply delicioso. I love the color on the chicken. I think the best reward of making a goood dinner is the fact that you can savor it for lunch too the next day. Those wraps will be such a handy lunch! Oh my, I laughed out loud for real while reading this. Yes, that bread-to-meat ratio is vitally important, and so is bumping up the foodie street cred! Love it! Great flavors at work here with the chicken wraps. A quick tasty lunch indeed. Omgosh. I have an urge to make this right now. At ten to midnight. Yum! those wraps look great! Lol, some "fusion" food is just ridiculous, but I still find them fascinating and fun. I love your chicken tikka wraps...In Singapore they sell this, served with mango chutney and it's wonderful. Wow, this sounds amazing! I'm always on the hunt for quick and tasty dinner ideas, and it looks like I just found a good one :) Thanks for sharing! I just turned my computer at my boyfriend and said: "Can we make these!?" this is indeed an easy breezy recipe for chicken tikka masala wraps. perfect for me. you have a wonderful blog and your writing is so catchy! Dear Azmina - LOVE KATI ROLLS!!! 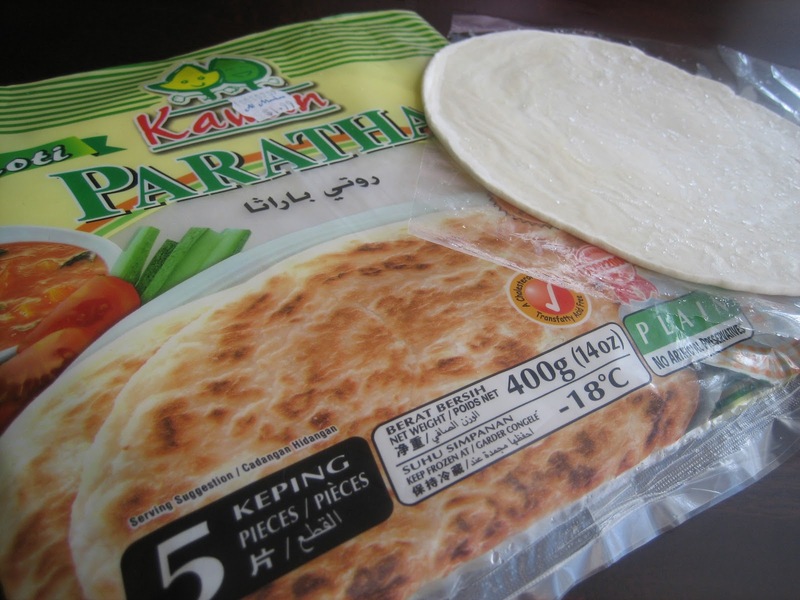 You've laid out my entire childhood craving in a roll...lol...Love that you use the Malaysian parathas - brilliant! Lol! I love that you're saving up your eating out allowances to get yourself a bag! Your recipe looks fantastic. I've just been introduced to Indian food by a good friend and am loving it. You have a great blog here and I will be stopping by more often. Wow this look so fantastic! I can't wait to try your recipe, my husband and I will really love it. 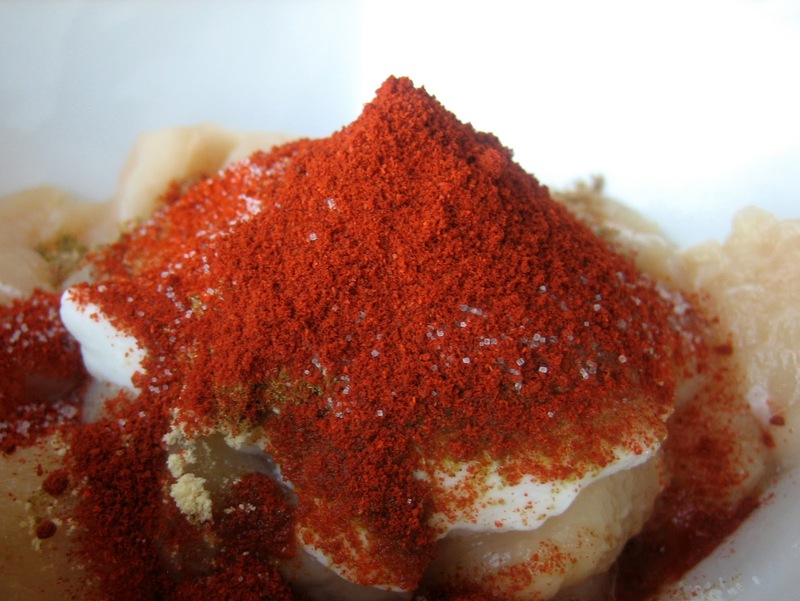 I think i will be spending a lot of time looking through you delivous recipes, you have such a wonderful blog.